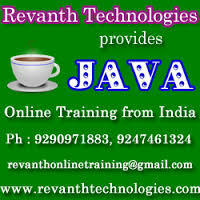 Revanth Technologies which is a high profiled Java and J2EE online training institute in India offers online training with real time experts and with real time concepts. We provide integrated IT training services and the complete range of IT training to provide all the requirements of both individual learners and corporate clients. We are the leaders in the field of professional Online IT training services in implementing world class infrastructure and technology. We provide the training with industry leading experts with real time scenarios.. In the course duration we are covering Core Java Training which includes Collection Frameworks and Swing Provided with Free Project implementation. Object Oriented Programming Concepts. Manual programming as well as training with Eclipse and J2EE Training covers JDBC with Servlets, JSP and EJB and struts with Webservers like Apache Tomcat 5.5 and Application Servers like Bea Weblogic Server with Eclipse IDE with XML. For more details please contact 9290971883 or 9247461324.